In the late 1880s, George W. Vanderbilt, then a young man of 25, came upon the perfect spot in North Carolina's Blue Ridge Mountains for a 250-room French Renaissance chateau to be built by his friend, architect Richard Morris Hunt. The great château would be called "Biltmore." Vanderbilt's decision to locate his mountain mansion near Asheville, NC, led to his purchase of a total of 125,000 acres surrounding the site. Today, Biltmore Estate encompasses approximately 8,000 acres, including formal and informal gardens designed by Frederick Law Olmsted, the father of landscape architecture in America. While the incomparable beauty of Biltmore Estate is the result of the combined creative talents and vision of all three men—Vanderbilt, Hunt and Olmsted—it is Biltmore House, which continues to be the centerpiece of Vanderbilt's legacy. This great house remains the largest private residence in America, a National Historic Landmark. George Vanderbilt officially opened the home to friends and family on Christmas Eve in 1895. He had created a country retreat where he could pursue his passion for art, literature and horticulture. After marrying American Edith Stuyvesant Dresser (1873–1958) in Paris during the summer of 1898, George and his new bride came to live at the estate. Their only child, Cornelia (1900–1976), was born and grew up at Biltmore. Construction of Biltmore House was under way in 1889; it was a massive undertaking that included a mansion, gardens, farms and woodlands. George Vanderbilt engaged two of the most distinguished designers of the 19th-century: architect Richard Morris Hunt (1828-1895) and landscape designer Frederick Law Olmsted (1822-1903). The centerpiece was a four-story stone house with a 780-ft. façade—a monument that would rival the surrounding mountains in grandeur. Hunt modeled the architecture on the richly-ornamented style of the French Renaissance and adapted elements, such as the stair tower and the steeply-pitched roof, from three famous early-16th-century châteaux in the Loire Valley: Blois, Chenonceau and Chambord. Even after six years, Biltmore House was not complete when George Vanderbilt opened it in 1895; work would continue for years. Its scale continues to be astounding: the house contains more than 11 million bricks; the massive stone spiral staircase rises four floors and has 102 steps. Through its center hangs an iron chandelier suspended from a single point, containing 72 electric light bulbs. Vanderbilt, the grandson of industrialist Commodore Cornelius Vanderbilt, was an intellectual, fluent in several languages, well-traveled and knowledgeable about art, architecture, music, agriculture, horticulture and literature. 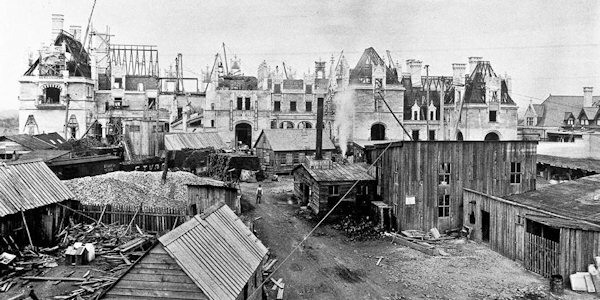 Vanderbilt's diverse and cultured tastes influenced his travels with architect Hunt while Biltmore House was being constructed. The two men traveled throughout Europe and the Orient, purchasing paintings, porcelains, bronzes, carpets and furniture. All of it would eventually become part of the collection of objects still in Biltmore House today. Indeed, it is often the collection, reflecting Vanderbilt's personal interests and tastes, that guests then, as well as now, find most fascinating. Inside, artworks by Renoir, Sargent, Whistler, Pellegrini and Boldini adorn the walls and, in one case, the ceiling. The furniture includes designs by Sheraton and Chippendale. A chess set and gaming table, which belonged to Napoleon when he was in exile at St. Helena, are on display in the salon, and Chinese goldfish bowls from the Ming Dynasty can be admired in the library. Eight 16th-century Flemish tapestries hang in the Banquet Hall and Tapestry Gallery. Fifty Persian and Oriental rugs cover marble and oak floors. Upstairs on the second and third floors, in addition to luxurious bedrooms, are areas where guests once played parlor games and took afternoon tea. The Fourth Floor features Maids' Bedrooms and the Observatory, with spectacular views from the top of the front of the house. Downstairs, the domestic servants kept the entire house running smoothly with the help of a state-of-the-art domestic nerve center, complete with a main kitchen, two specialty kitchens, large laundry complex, refrigeration systems and pantries. Fully electric and centrally heated, Biltmore House, at the time of its completion, was considered one of the most technologically advanced structures ever built and is still admired today for its innovative engineering. It used some of Thomas Edison's first light bulbs, boasted a fire alarm system, an electrical call box system for servants, two elevators, elaborate indoor plumbing for all 34 bedrooms and a relatively newfangled invention called the telephone. Vanderbilt also wanted his mountain home to provide family and friends with recreational pleasures: an indoor swimming pool, bowling alley and gymnasium are located downstairs. While Biltmore House is the focal point of the Estate, it is clear when walking onto the library terrace and gazing below into the gardens that Olmsted's genius is an integral part of Biltmore—his sweeping landscape providing a fitting backdrop for this magnificent château. Rare Franklinia and Persian ironwood trees grow side by side with mountain laurel, rhododendron, native azaleas and white pines. 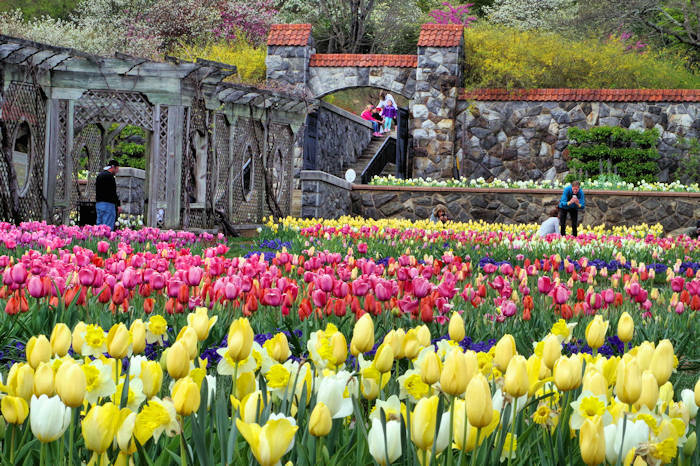 A four-acre Walled Garden features 50,000 tulips each spring, summer annuals in warmer months and chrysanthemums in the autumn, as well as an All-American Rose Garden. Biltmore's unique horticultural environment creates a blooming season that begins in early spring and continues until the first frost: in other words, something is blooming at Biltmore from March through November. Even during winter months, the conservatory is full of colorful tropical plants such as poinsettias, orchids, lilies, cacti and bougainvillea. 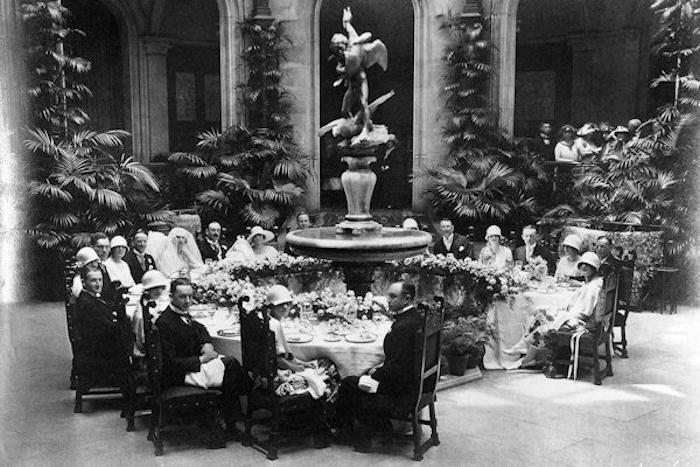 Read more about the Horticulture History at Biltmore. Antler Hill Village includes the Historic Horse Barn, designed in 1900 by architect Richard Howland Hunt, originally the hub of agricultural operations on Biltmore Estate and is once again with crafters, music, displays of original farm equipment and more. The appraised value of the 135,000 square foot Biltmore House is about $37 million, according to Buncombe County tax appraisers in 2017. The value of the part of the estate that is open to the public with 2,194 acres, the House, hotels, restaurants, and other buildings exceed $300 million. 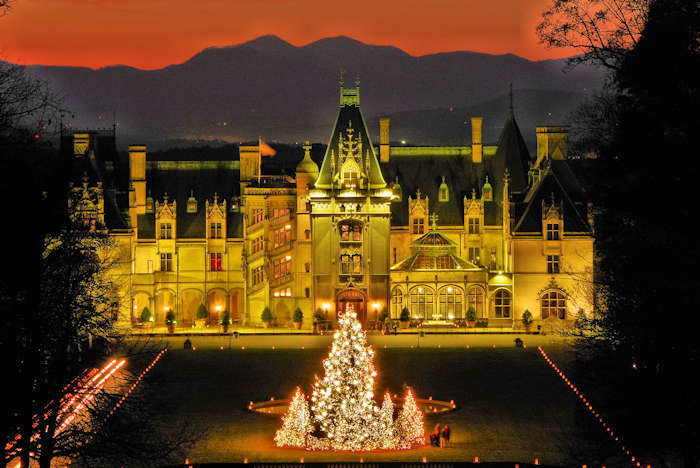 Who owns Biltmore Estate today? The estate is still family owned. George Vanderbilt's great grandson, Bill Cecil Jr, is current CEO of Biltmore Company. His father (and George Vanderbilt's grandson William Amherst Vanderbilt Cecil) was responsible for most of the dramatic growth of Biltmore. He died on October 31, 2017. His wife Mimi passed away just a few weeks later. In 1957, Cecil married Mary “Mimi” Ryan, a lawyer with a Wall Street firm. 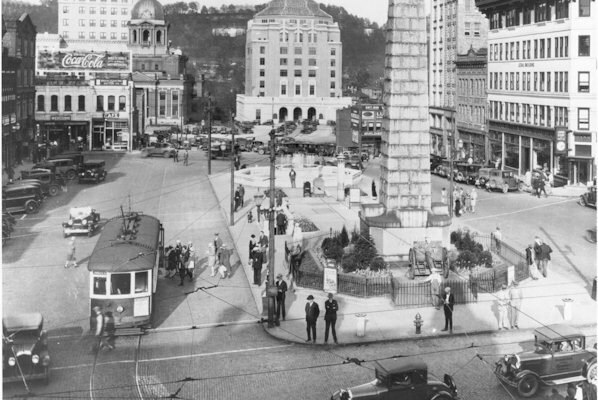 In 1960, they moved from New York to Asheville to focus on preserving Biltmore by including tourism. The number of employees at Biltmore has dramatically increased from 100 in the mid 1970s to 2,400 in 2017. 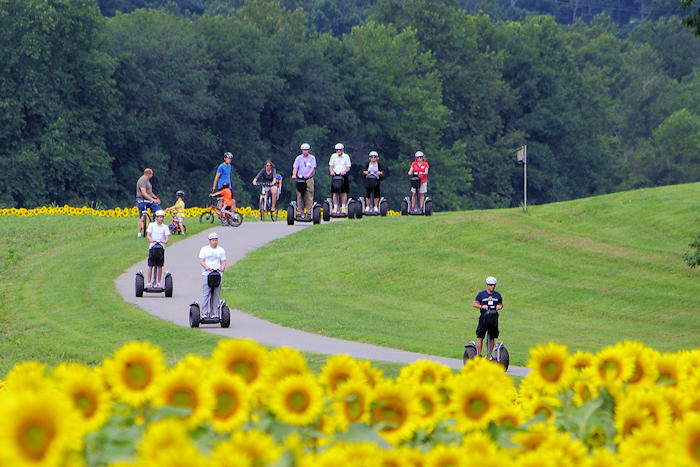 Plan a trip with our Biltmore Insider's Guide.